Wonderful photo… did you get a macro lens? Goodness, I’d no idea you could comment on individual photos like this. Well done. No, it’s just the same old lens, but I’m working on it and I cropped it a lot to make the slug bigger on the page. 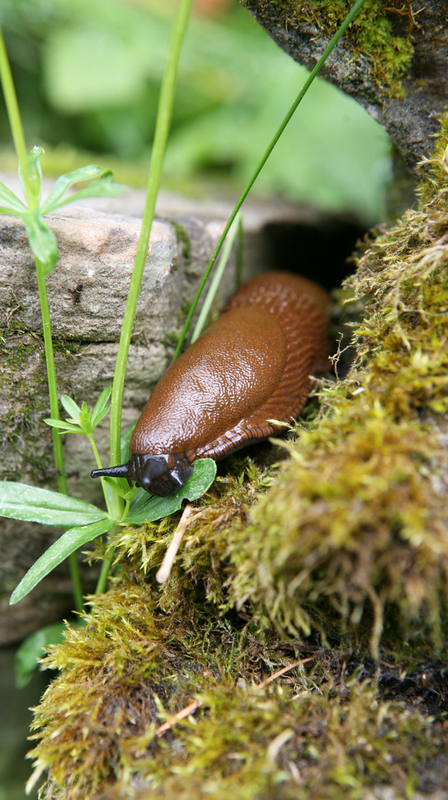 You’d think you could eat slugs, but they’re mostly water. All these wonderful peaceful shots of friendly fauna make me wish I had something similar to share. Instead all I have is a shot taken a couple of years ago in mid-autmn, when I went to hangf out some laundry one morning and interrupted a poor bird’s breakfast. Did you polish it with wax before shooting it at close range? It looks like it. They have this very peculiar slime on them; if you pick them up you get it on your hands and it won’t come off even when you wash them (your hands), you have to scrape it off. Very clever; I suppose the advantage is that it doesn’t get dissolved away by the rain, but how does it work? It can’t be oil-based. I bet Dearieme knows. Ah yes, this is much better than mine. But then you clearly have a great camera.